This page includes lighthouses of two small island "special municipalities" of the Netherlands located in the Leeward Islands at the northeastern corner of the Caribbean Sea. Since the Netherlands Antilles was dissolved in 2010 these two islands and the island of Bonaire in the southern Caribbean are known collectively as the Caribbean Netherlands. Saba is a small island about 80 km (50 mi) southwest of St.-Barthélemy. The island is essentially a single volcanic peak, Mt. Scenery; the mountain rises to an elevation of 870 m (2854 ft). Saba was first settled by the Dutch around 1640; although it changed hands a number of times after that it has been Dutch again since 1816. The population is about 2000. Saba has no protected harbor capable of receiving cruise ships, so it is one of the least visited islands of the Caribbean. Access is by short-takeoff aircraft or ferry from the other Dutch Leeward Islands (Sint Maartin and Sint Eustatius). Hair-raising roads snake around the mountian to connect the small villages of the island. Sint Eustatius, nicknamed Statia, is a somewhat larger island located southeast of Saba and northwest of St. Kitts. It was settled by the Dutch in 1636 and remained Dutch thereafter except for an occupation by British forces in 1781-84. Less mountainous than Saba, Sint Eustatius has room for a full-size airport runway, but it has only a small protected harbor at Oranjestad, the capital. The population of the island is about 3500. Special thanks to Alexander Trabas for determining the location of the elusive Oranjestad Light on Statia. Navigational chart for Saba and Sint Eustatius. Date unknown. Active; focal plane about 325 m (1070 ft); two white flashes every 10 s. Approx. 15 m (49 ft) square skeletal communications tower mounted on a square 1-story white concrete base. A photo is above right, Trabas has Capt. Peter Mosselberger's photo, Lightphotos.net has an aerial photo, and Google has an indistinct satellite view. In the original of a photo above (no longer online), the navigation light could be seen on the left rear of the tower, near the top. 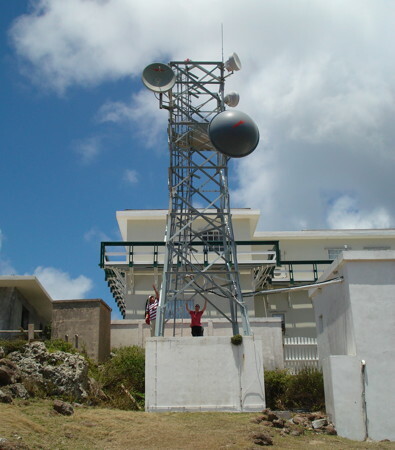 The microwave antennas on the tower are pointed southeast toward the island of Sint Eustatius. Located on the steep slope of Mt. Scenery at St. John's, a village on the south side of the island. Site open, tower closed. Admiralty J5667.3; NGA 14738. Date unknown. Active; focal plane 40 m (131 ft); three white flashes every 15 s. 6 m (20 ft) mast mounted on the southern corner of the historic Fort Oranje. 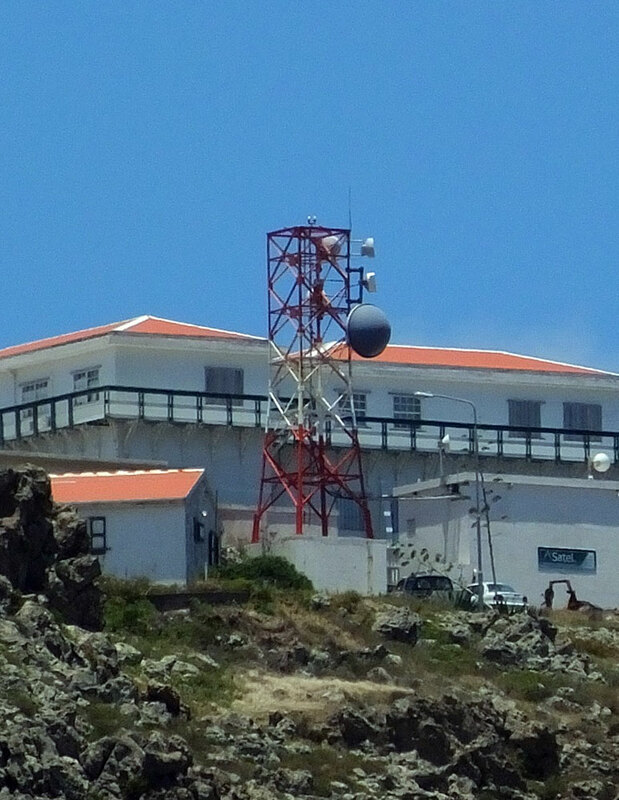 The light is at the upper left in a photo (posted by the Statia Museum) of the interior of the fort, but the mast is inconspicuous in Bing's satellite view of the fort. The original light at Oranjestad, established in 1893, was on the roof of the harbor office. Located atop a steep bluff on the west side of the island, about 400 m (1/4 mi) north of the Oranjestad harbor. Site open. Admiralty J5668.5; NGA 14742. Created October 16, 2012. Checked and revised January 13, 2019. Lighthouses: 2. Site copyright 2019 Russ Rowlett and the University of North Carolina at Chapel Hill.